KPMG in Bermuda announced leadership changes, saying that effective October 1, 2017, the role of Chairman and Chief Executive Officer will be split. 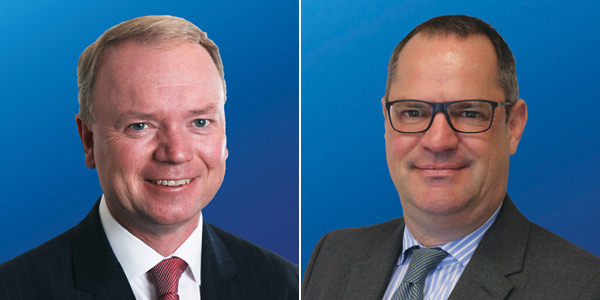 Neil Patterson will retain the firm’s Chairmanship and Mike Morrison, Head of Advisory, will become the firm’s Chief Executive Officer. This marks the first time in the firm’s history where a leader from KPMG’s Advisory Practice will be appointed CEO. Neil Patterson commented “It has been my pleasure to lead our firm as its Chairman and CEO over the last nine years; however the time has come for fresh leadership. Mike will take on the responsibility for the day-to-day management of the firm and I will provide ongoing guidance and support to Mike. “Mike has led our Advisory Practice for eight years, over which time he has built a market-leading team of almost fifty professionals that is, by far, the leading practice in Bermuda. “He will bring fresh energy, a strong collaborative style and a new perspective to the CEO role and I am confident that the firm will go onto to even greater success under his leadership”. Charles Thresh will become the Head of their Advisory Practice. Will McCallum will become the Head of their Tax Practice. Mike Morrison said “It is an exciting time for the firm and I look forward to the opportunities and challenges that being in the CEO role will provide. “I would like to congratulate Charles and Will on their promotions to practice leaders and thank Catherine Sheridan-Moore for her exemplary leadership of our Tax practice for the past 15 years and her ongoing support for Will in his new role”. So… zero women in leadership and just one Black man? Oi Vey. There are Partners, Directors and Senior Managers that are women. But I am with you on only having one black man (and only Bermudian) as a Partner.